Since 1973, the Greater Washington Community Foundation has been a champion of thriving communities and a catalyst for change made possible through local philanthropic engagement, effective community investment, and civic leadership. We work with donors and partners to make a real difference every day in our communities by aligning resources and leveraging shared interests to amplify impact. As the region’s largest local funder, we have invested more than $1.2 billion to build more equitable, just, and enriching communities where all residents can live, work, and thrive. As a tax-exempt public charity, we are a trusted steward of local charitable assets with the ability to accept donations and make grants to effective nonprofits. We manage hundreds of charitable giving funds on behalf of generous individuals, families, and businesses. We partner with our donors to pursue their charitable goals, identify impactful nonprofits, and pool resources for the greater good of our communities. Donors rely on us as their trusted partner to make charitable giving easy, flexible, tax-smart, efficient, personal and deeply rewarding. And we take seriously our responsibility to be the best stewards of our donor’s dollars, and partner to the community organizations making our vision for lasting change possible. 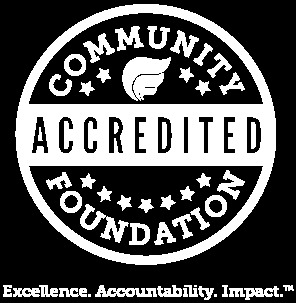 We are accredited by the Council on Foundations for meeting its national standards for community foundations and maintain a four-star Charity Navigator rating. In FY2018, The Community Foundation received more than $80 million in donor contributions and granted out more than $96 million to a diverse range of causes including human services, education, the environment, health, the arts and economic development. The Greater Washington Community Foundation exists to Build Thriving Communities by providing community leadership, inspiring local giving, promoting civic engagement, and guiding strategic philanthropy. The Community Foundation envisions a Greater Washington region that is an equitable, just and enriching place for all residents to live, work and thrive. Listen to, be a champion for, and make a difference in our community. Do the right thing — by our donors, our partners, and each other. Incorporate diversity, equity, and inclusion in all aspects of our work.